Espresso might help wake you up in the morning but, used improperly, it can hinder your weight loss efforts. It contains caffeine, a stimulent chemical that affects your brain, inducing a feeling of alertness. While caffeine taken before a workout might improve your athletic performance, other factors related to espresso consumption can counter-act this benefit. You don't have to cut espresso out of your diet entirely to lose weight, but consume it in moderation and avoid it at night. The main active ingredient in espresso is caffeine. A 1-oz. shot of espresso contains 30 to 90 milligrams of caffeine. For example, two brands of coffeehouse espresso contain 75 mg of caffeine per 1-oz. shot, the Center for Science in the Public Interest reports. Multiple shots of espresso contain a correspondingly higher dose of caffeine. Although some people may find espresso's stimulatory effect helpful for increasing physical activity, others may find that it results in increased stress, fatigue and weight gain. Espresso's stimulant effect on your brain has major drawbacks when you're trying to sleep -- it can prevent your brain from slowing down and keep you tossing and turning in an attempt to fall asleep. However, a good night's sleep proves beneficial for weight loss, because sleep deprivation can cause you to over-eat during the day, which in turn leads to weight gain, explains the University of Colorado. Espresso on its own doesn't contain many calories, but if you consume it as part of a beverage -- for example, a latte or cappuccino -- you can easily pack on the calories. A large latte at a leading coffee house contains 20 ounces of fluid, with a large portion of that coming from calorie-rich milk. Sugars, syrup and other sweetener sometimes served with espresso also pack on the calories and contribute to weight gain. Drinking sugary espresso drinks also causes your blood sugar to rise quickly, and the crash that follows triggers food cravings. 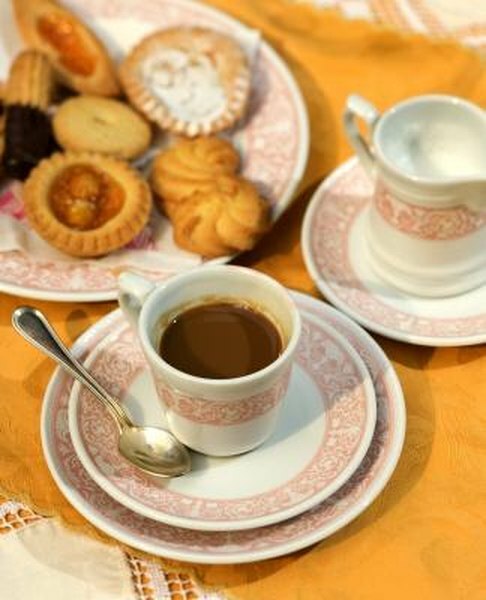 Minimise the effect of espresso on weight loss by avoiding it before bedtime and avoiding high-calorie espresso drinks. Instead of a hot or iced latte, try a hot or iced Americano -- a drink made with espresso and water. Forego calorie-laden sugar or syrup, and instead sweeten your espresso with stevia, an all-natural low-calorie sweetener. Don't consume espresso within six hours of your bedtime, and avoid it if you already have a sleep disorder. Limit your caffeine intake to a moderate amount -- approximately 250 milligrams, or the equivalent of 3 shots of espresso, according to the University of Maryland Medical Center.